Reaching Stonehaven was an exercise in itself, only a week after the foiled attack on BA aircraft bound for the US. The evening before taking the plane from Geneva, an email from BA recommends not taking any fluids, not even in the hold luggage - i.e. no toothpaste, no suncream etc ! On arrival in Gatwick, even transit passengers are kindly requested to leave the airport buildings completely, literally into the street, before going through no less than 6 security checks, complete with frisking, and the famous clear pastic bag to hold handkerchiefs and the like. Amazing but true, I have only 2h of delay on arrival in Edinburgh - and thus I meet, by chance, Susan, Mathilde and Peter in the railway station ! The Imram meanwhile is in Stonehaven with only Anja & Salvatore on board. After shopping in the evening, and taking fuel in the morning, we leave for Bell Rock and Holy Island. Weather on the way isn't impressive - with some violent gusts in the vicinity of Inchcape - a notorious reef, awash most of the time, some 10 miles out of the coast near Dundee, on which Bell Rock lighthouse has been built between 1807 and 1810 under the direction of Robert Stevenson. The light is called Bell Rock because of the 14th century attempt by the abbot from Arbroath to install a warning bell on it. Legend has it that the bell was subsequently stolen by a Dutch pirate. Although 28 m tall and equiped with a light with a nominal range of 18 nm, we only see Bell Rock when we're less than 2 nm away. The wind quiets down afterwards, and on approach of Holy Island we find ourselves in dense fog - to the extent that the cardinal and lateral marks for the sandbanks near the entrance become visible only when they are a few boat lengths away. We don't regret that the boat is equiped with a radar ... On arrival at the nominal harbour, we anchor and go to sleep - it is only later that we discover the castle, abbey and other boats anchored nearby. Arrived in holy island, lindisfarne. Verx fast, 6bf, great sailing. Terrible fog. Imram is missing you. Holy Island, also known as Lindisfarne, is one the first places in the present UK to have been "visited" by the Vikings in the year 793. It is a kind of British Mont St Michel, accessible via a causeway only at low tide. Well worth a visit, if only for the tidal landscape, the castle at the entrance to the bay (construction started in 1550), the ruins of the Benedictine Priory (built during the late 11th century), and the village. During the day, we understand the source of our power supply problems: the 2 service batteries badly need water, 3.5 l of it as we discover later ! Salvatore manages to convince a bus with retired British tourists to take him to the nearest fuel station, in exchange for an account of earlier Imram travels - and thus we manage to fix our battery problem. Since good things rarely come alone, Haude informs us during the day that she has managed to find a plane ticket to Edinburgh, and in the evening she joins us in Holy Island. After a stroll over the island, and an as usual superb dinner, it is bed-time ... and departure for Norway in the morning. The Imram had arrived in Stonehaven a few days earlier and most of the crew had left ... to the effect that we were only 3 on board. We leave Stonehaven just before noon, so as to arrive with favourable tides in Holy Island. On the way, we pass by Bell Rock lighthouse - over 10 M out of the coast and built on a rock which is most of the time under water. Its construction, under Robert Stevenson in the early 19th century, earned a place in the BBS's Seven Wonders of the Industrial World. Weather is appropriate when we finally see the lighthouse, at a distance of only 1.5 M: 6 Bf wind with rain. In the early morning we arrive at Holy Island. Entry is in principle well marked by a transit - but unfortunately, we've very dense fog. Approaching by radar, we only see by eye a cardinal mark which is important for the approach, when we're roughly a boat length away. After anchoring, we go and sleep - when waking up a few hours later, we at last see the other boats moored in the vicinity. Holy Island was in 793 the first British place raided by the Vikings. There are ruins of an originally 7th century monastery, several times rebuilt, and a 16th century castle. Already impressive by themselves, the tidal changes of the landscape make the place truely unique. Meanwhile, the service batteries of the boat are desperately low in water to the extent that the autopilot frequently fails to work. Salvatore is charged with the task of finding distilled water. Bearing in mind that Holy Island can only be reached over a causeway at low water, timing is critical. A regular round trip to the mainland by bus could therefore take 8 hours. Instead, he manages to get a ride from a tourist bus to the nearby town of Berwick-upon-Tweed in exchange for ... telling the passengers the story of the earlier Imram tours. And he finds distilled water just in time to take the regular bus from Berwick-upon-Tweed back at low water. Later in the evening, Haude joins us. She only learned on Tue of the trip and discussed the issue with her chief on Wed. Plans for a meeting point were made Wed night and plane tickets were bought on Thu. Left for Norway. 3bf, N. Haude had no pb finding us. All in very good mood. Keeping you updated. Refilled service battery w 3l of HO2. Say hello to matty. 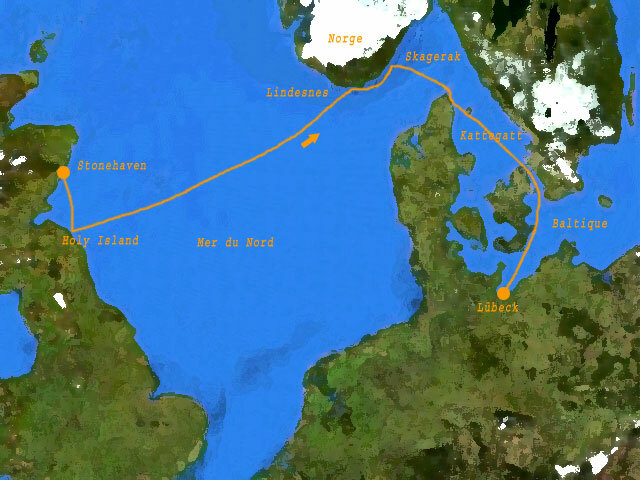 A leg which will enter the Imram history book: the actual crossing, from Holy Island to Joessingfjord, of 315 M was made in 47h55 mins, on a single tack, without engine, and using only positioning by sextant. After lunch in the Joessingfjord, we decide to move to Kirkehamm which proves an excellent choice: a charming village on an island that offers beautiful hikes. We stumble onto the remainders of an aircraft. Numerous wild berries are found all over the place. A superb dinner concludes this crossing. Quietly hopping along the coast ... we spend the night anchored in a bay. Long spinnaker tack, which ends moored in Lillesand. The place has a choice of approach routes, all of which seem to use the church as reference point. It is easy to imagine what the view from the church is like ! Arrived in Lillesand. Really, really pretty! Sun. Spinacker. :-) leaving tomorrow for Danmark. Any decision on final destination? Smiles anja. Crossing the Skagerrak is something one doesn't take lightly in general - but this time, there is strictly no wind most of the way ! The real surprise comes when approaching Skagen: an endless string of cargo ships is entering and leaving the Baltic. Cargo traffic is not something the Imram is used to - but it will stay with us until Lübeck. In the early morning, we moor in the harbour of Skagen. Last night on board for Anja and Haude - they leave in the morning by train for Geneva. Leaving Skagen on a Sun morning is an experience one should not miss. It starts Fri evening and Sat morning when an armada of Swedish boats arrives, filling the harbour to capacity - one can literally cross stepping from one boat to the next. The reason for this invasion is easy to guess. On Sun morning, the same fleet does the return trip - with their autopilot and GPS finding the way. Presumably, the Danish weather forecasters had joined in the party: they announced perfectly nice sailing weather for the next day. With a crew of just 2, we therefore leave with optimism for København. But ... in the middle of the night, the wind suddenly picks up to gale force while we are about to cross the cargo routes at Anholt. Fortunately, the wind direction is favourable and we continue our route, under bare poles, at a speed of 4-5 kt. In the late afternoon, we moor in the Svanemøllen harbour. Maybe the shortest leg of the season: 5.2 M to move from the harbour to downtown, making photos of the Imram with the Mermaid in the background, and then mooring between Royal Palace and Opera House. Probably the most civilised mooring ever for the Imram ! Mostly gentle wind, but a near gale on arrival in Klintholm - just as unannounced. Fortunately, the island of Møn turns out to be well worth the visit and we spend the whole of Thu there too, walking and bicyling, waiting for the wind to settle. Klintholm used to be a fishing harbour, which has in recent years been enlarged with a harbour for sailing boats. A small restaurant nearby serves delicious flounders. In Klintholm, we meet Jens, an old friend from CERN, who will stay with us for the final bit to Germany. Not anymore listening to the Danish weather bulletins, and relying instead on the Northwood weather charts, we pick a slot - and arrive without further surprises in Lübeck. Jens introduces us to a Germany delicacy, the Kurrywurst: a finely ground sausage of rectangular cross section, with a brownish jam on top. The latter alledgedly contains the spices from which the thing gets its name. The lady correctly diagnoses us as beginners in the art of eating this culinary masterpiece and directs us to a table where she explains how to dismount the paper tray and transform it in pliers with which the sausage can be eaten. Professionals do this while walking, it seems. Later that night, we have also a more conventional meal - which turns out to be of remarkable quality. The Imram is to spend the winter on land - and for this, the mast has to be taken down and disassembled. The exercise takes us a couple of days and on Tue we leave for home.